Whether you are roasting, smoking, or even deep-frying a whole bird, the last thing you want is dry, flavorless meat. Brines, rubs, and marinades can all do their part to take your poultry to the next level. But if you really want to ensure tender, succulent meat with flavor-packed deep down to the bone, it is time to turn to injection recipes. 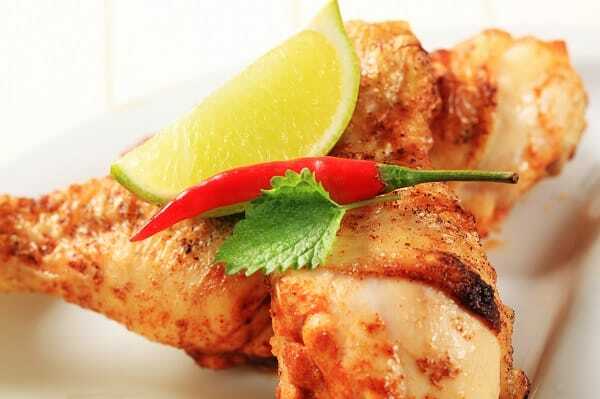 If you have never considered injecting poultry with a marinade, we highly recommend you keep reading. It’s the secret to the most succulent meat you have ever tasted! 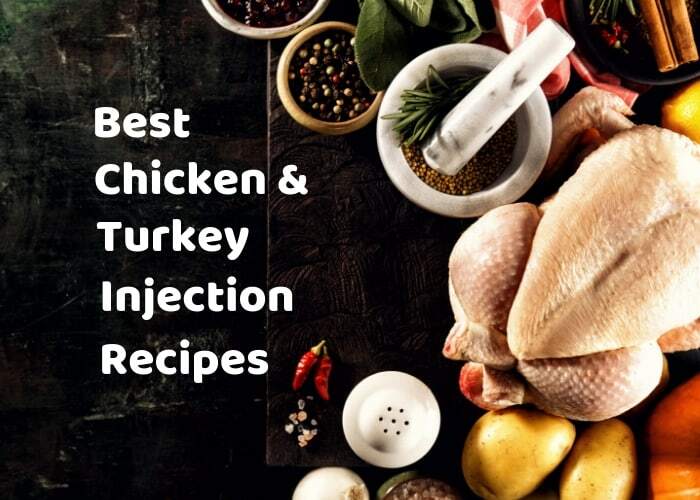 We will even share what we consider to be the best chicken and turkey injection recipes. 4 Why Inject Chickens or Turkeys? 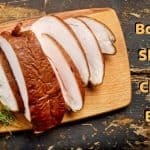 Should you also use rubs and brining? 5 What are the Best Ingredients for Injector Marinades? Meat is typically marinated by allowing it to soak in a sauce to soften and add flavor. While it can have very tasty results, the unfortunate truth about this method is that most of that flavor stays in the top ¼ inch of meat. A simple solution to this problem is to use a meat injector to deeply penetrate the meat and allow the marinade to pack flavor into even the thickest parts of the bird. The most efficient way to add flavor and moisture to chicken and turkey is to use an injector. A marinade injector looks like a giant syringe, and it functions in much the same way. You can load the syringe with your favorite marinades or sauces and use the sharp tip to penetrate the meat. The flavors that release lock inside the meat, sealing them inside. 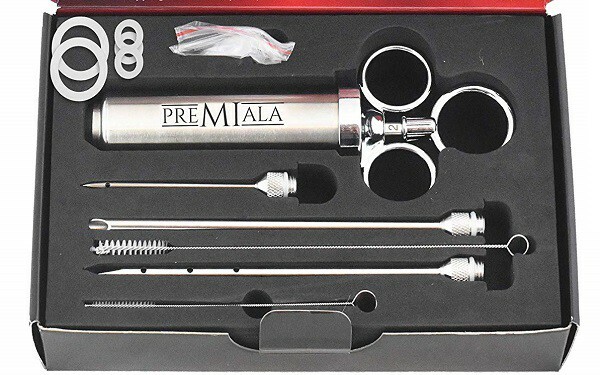 Whether you call it a marinade injector, meat injector, or my personal favorite – the flavor injector- we have handpicked a list of the best marinade injectors for you to peruse. Don’t buy one before you check out our review! Your new injector is going to become one of your most trusted kitchen tools. We can show you what to look for in the perfect marinade injector. Once you have whipped up one of the fantastic marinades mentioned below, you are ready to start injecting. Pick up your marinade injector and load the barrel of the syringe with marinade. You can use a narrow glass or small funnel for easing pouring if needed. Now, you may be tempted to start stabbing away at the meat. But the fewer puncture holes, the better, at least when it comes to the finished look of the bird. The goal is to penetrate the meat evenly. To do that and keep the number of holes minimal, you will want to make several injections in the same hole. When you re-insert the needle in the same hole, do so with the needle at a different angle. The various angles will spread the marinade evenly and keep the flavor uniform throughout the meat. When penetrating the meat, be sure to aim for the center. If you go too deep, the marinade may slip out the other side. If you don’t penetrate deep enough, it will just spill back out instead of being sealed inside. Also remember to depress the plunger slowly, giving the marinade time to disperse. Make sure to do at least one injection into each thigh, breast, and leg. These are the thickest parts of the bird and will require the most marinade. Ideally, you should use about .5oz of marinade per 5lbs. of meat. Why Inject Chickens or Turkeys? 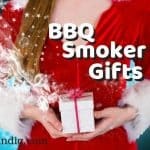 Should you also use rubs and brining? Marinades, rubs, and brines are great for adding flavor, but they also have their downsides. Just letting the meat soak in a marinade doesn’t let the flavor penetrate very far. Plus, you have to wastefully toss out the contaminated marinade when you go to cook the meat. Brines take up a lot of time and fridge space. Rubs only season the surface of the meat. 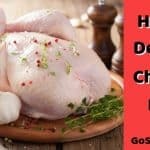 Injecting your chicken or turkey is more like marinating it from the inside. It is a quick and efficient method for adding both flavor and moisture. There is no lengthy wait, and no wasted marinade to throw out. While it is not necessary to also use a rub or brine in addition to the injected marinade, it can add additional flavors. Just be cautious to not overdo it. You do not want to overpower the flavor of the meat, simply enhance it. What are the Best Ingredients for Injector Marinades? The first thing you are going to want are ingredients that add moisture to the meat. Most commonly, injection recipes call for melted butter, oils, or broths. But feel free to branch out! Vinegar, wines, and beers could also make for a delicious marinade. Spices should be finely ground, such as garlic powder and onion powder. 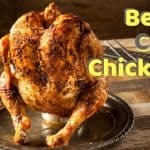 Some of the most popular injection recipes combine these spices with Cajun seasoning or other spicy flavorings for a bird with real bite! If using ingredients that have solid bits such as dried herbs or crushed garlic, make sure you grind them properly before adding them to the marinade. Large pieces can clog the needle of your injector unless it came with a wide needle option. Is your mouth watering yet? If not, it will be once you get a look at these injection recipes. We have combined our favorite handpicked recipes for injection marinades. These are perfect for turkey, chicken, and everything else! Some like it hot! If that includes you, this hot and spicy injection marinade will give your chicken or turkey just the kick you are looking for. Liquid crab boil and Cajun seasoning give it a delicious flavor that will make you think you are in creole country! But you don’t have to be born on the bayou to enjoy this tasty marinade. Combine all of the ingredients in a saucepan over medium-low heat. Stir constantly until the butter melts. Once the sauce has completely liquified, remove the pan from the heat and allow to cool for five minutes. While still mostly warm, stir the sauce to make sure the ingredients are fully combined and load it into your injector. This injection marinade combines two of our favorite things: beer and butter! It can’t get much better than that! This injection recipe results in melt-in-your-mouth tenderness that is sure to please a crowd. Allow all of the ingredients to combine in a saucepan over low heat until the butter melts. Continue to stir the sauce until all of the salt dissolves and the mixture is thin and even. Let it cool slightly for five minutes. You do not want it to be too hot when you load the injector. But you also do not want the butter to solidify! If you want to add flavor inside and out, pair your injection marinade with a good rub! The injection helps keep the meat tender and juicy, and the rub takes the flavor to the next level. The hint of lemon in the injection and the fresh herbs of the rub are a match made in heaven. This injection recipe takes a little longer than others, but we think it is one of the best! In a small bowl, combine all of the ingredients for the marinade. Cover the bowl with plastic wrap and refrigerate for at least 30 minutes to let the flavors blend together. While the marinade rests, begin making the rub. Mix all of the rub ingredients together in a small bowl until evenly combined. This should have the consistency of a buttery spread. Begin to prepare your bird by separating the skin from the meat. Run your hand underneath of the skin, and you will feel the separation creating little “pockets”. Heap spoonfuls of the rub into those pockets. You will want to make sure to spread the mixture evenly and in different parts of the bird, such as the breast and thighs. Add your marinade to the injector and inject it into the meatiest parts of the bird. Be sure to change the angle of the needle repeatedly! If you have any remaining rub, you can spread it all over the outside of the bird. This makes for incredibly crispy, aromatic skin that is simply delicious. Want to keep it simple and spicy? This Cajun injection marinade requires only three ingredients! It doesn’t get much easier than that. Whisk together all of the ingredients in a small bowl. While the mixture is still warm (not hot! ), add it to your injector and inject it all over your poultry in the meatiest portions. If your bird is small, feel free to cut this recipe in half. This injection recipe makes enough for an average turkey. Cajun spices aren’t for everyone! If you are looking for a delicious injection marinade that still packs in plenty of flavor, try this Italian herb marinade. The level of spice is fairly mild, but the wide variety of Italian herbs used gives it a rich and delicious taste. Before beginning to mix the ingredients, be sure to grind all of the dried herbs. Otherwise, you may clog your injector’s needle! You can use a spice grinder or a mortar and pestle to properly grind the herbs. The great thing about this injection recipe is that there is very little time involved. There is nothing to melt or warm. Simply combine all of the ingredients in a small bowl. Then, add it to the injector. Be aware that the herbs will tend to settle to the bottom of the marinade. So give it a stir before each time that you need to reload the injector. Injection marinades reach deep into the meat, making for especially flavorful chicken and turkey. It is also one of the quickest and easiest ways to enhance a meal. Injecting can do the job of a regular brine or marinade in minutes compared to hours. It is quick, convenient, and the flavor can’t be beaten. With so many different injection recipes available, it can be exciting to test out new flavor combinations. It’s time to start experimenting! What are your favorite injection marinade recipes? Let us know what has worked for you!